Last week, I presented on the future of sports at a fund raiser for the Rutgers University Women’s Soccer team. A local Article on the topic captured the high-level themes, but for those interested, here is the full presentation along with two very good reports I tapped into from Delaware North on the future of sports: The Future of Sports 2016 Report and The Future of Sports 2015 Report. Strong maybe, but not hype. The risk is real and not limited to Healthcare. 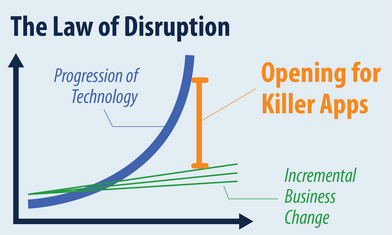 The visual below is a great representation of the law of disruption. The progression of technology is riding an exponential curve. With this acceleration comes a progression of disruption where incremental business change can no longer keep pace. Disruption and the need for transformative actions occur when this scenario takes hold, and the enterprise has not taken steps to respond. A failure to respond in this fast paced, change oriented world is likely catastrophic, but the opening for killer apps depicted in the visual presents both risk and tremendous market opportunity.